Last few weeks one term that I have been constantly reading is Krishna’s and Guru’s lotus feet. Somehow the term lotus feet was jumping out from every lecture and every reading I was doing. Taking that as a cue I have compiled this post for the pleasure of the devotees of the lotus feet of Supreme Lord. My own attachment for Krishna’s lotus feet went up a few notches higher simply by searching on this topic! Krishna’s lotus feet should be our first priority! When a devotee wants to see the transcendental form of the Lord, he begins his meditation on the Lord’s body by first looking at the feet of the Lord. One should begin to see the Lord from His lotus feet, gradually rising to the thighs, waist, chest and face. One should not try to look at the face of the Lord without being accustomed to seeing the lotus feet of the Lord. By his constitutional position, Lord Siva is always great and auspicious, but since he has accepted on his head the Ganges water, which emanated from the lotus feet of the Lord, he has become even more auspicious and important. The stress is on the lotus feet of the Lord. A relationship with the lotus feet of the Lord can even enhance the importance of Lord Siva, what to speak of other, ordinary living entities. It is stated herein by the Kumäras that the lotus feet of Lord Krishna are the ultimate reservoir of all pleasure. The beauty of the lotus feet of the Lord is compared to the petals of a lotus flower which grows in the autumn season. By nature’s law, in autumn the dirty or muddy waters of rivers and lakes become very clean. At that time the lotus flowers growing in the lakes appear very bright and beautiful. The lotus flower itself is compared to the lotus feet of the Lord, and the petals are compared to the nails of the feet of the Lord. Why are they called Lotus feet? The spiritual planet, Goloka Vṛndāvana, the eternal abode of Lord Kṛṣṇa, is shaped like the whorl of a lotus flower. Even when the Lord descends to any one of the mundane planets, He does so by manifesting His own abode as it is. Thus His feet remain always on the same big whorl of the lotus flower. His feet are also as beautiful as the lotus flower. Therefore it is said that Lord Kṛṣṇa has lotus feet. 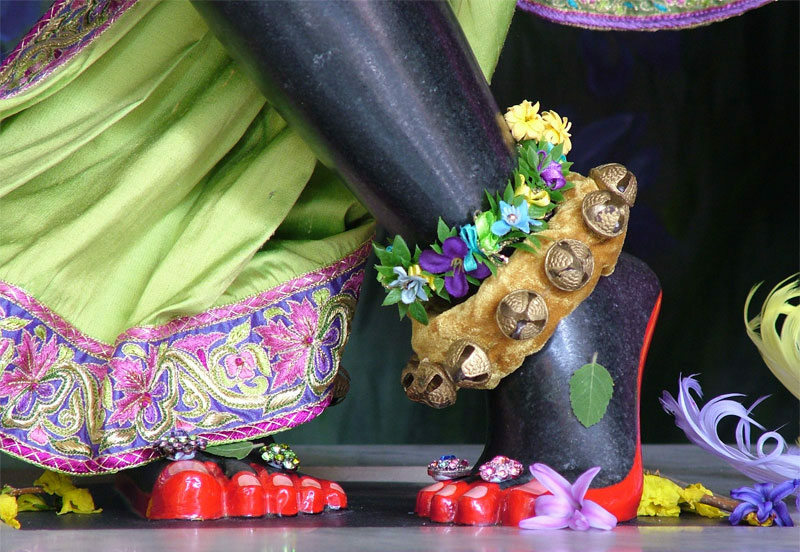 Pure devotees are attached to Krishna’s lotus feet. The pure devotees are always hankering after the lotus feet of the Lord. The lotus has a kind of honey which is transcendentally relished by the devotees. They are like the bees who are always after the honey. 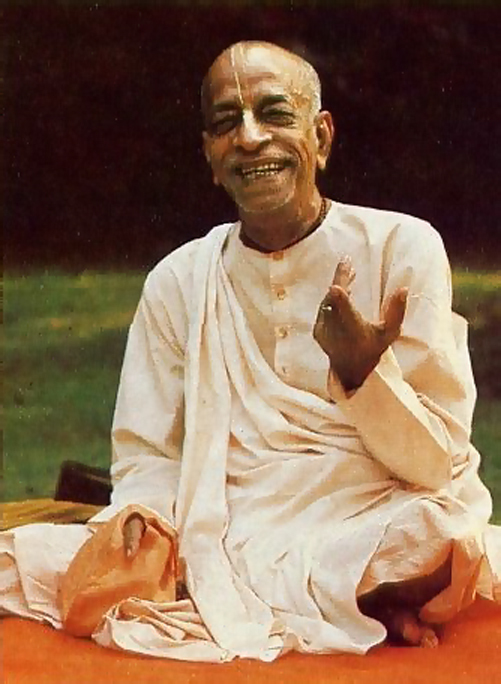 Srila Rupa Gosvami, the great devotee acharaya of the Gaudia-Vaishnava-sampradaya, has sung a song about this lotus honey, comparing himself to the bee: “O my Lord Krishna, I beg to offer my prayers unto You. My mind is like the bee, and it is after some honey. Kindly, therefore, give my bee-mind a place at Your lotus feet, which are the resources for all transcendental honey. I know that even big demigods like Brahmä do not see the rays of the nails of Your lotus feet, even though they are engaged in deep meditation for years together. Still, O infallible one, my ambition is such, for You are very merciful to your surrendered devotees. O Mädhava, I know also that I have no genuine devotion for the service of Your lotus feet, but because Your Lordship is inconceivably powerful, You can do what is impossible to be done. Your lotus feet can deride even the nectar of the heavenly kingdom, and therefore I am very much attracted by them. O supreme eternal, please, therefore, let my mind be fixed at Your lotus feet so that eternally I may be able to relish the taste of Your transcendental service.” The devotees are satisfied with being placed at the lotus feet of the Lord and have no ambition to see His all-beautiful face or aspire for the protection of the strong arms of the Lord. They are humble by nature, and the Lord is always leaning towards such humble devotees. No need to visit any holy place! Lord Govinda, the Supreme Personality of Godhead, is described here as Tirthapäda. Tirtha means “sanctified place,” and päda means “the lotus feet of the Lord.” People go to a sanctified place to free themselves from all sinful reactions. In other words, those who are devoted to the lotus feet of the Supreme Personality of Godhead, Krishna, automatically become sanctified. The Lord’s lotus feet are called tirtha-päda because under their protection there are hundreds and thousands of saintly persons who sanctify the sacred places of pilgrimage. Srila Narottama dasa Thaukura, a great acharay of the Gaudiya Vaishnava-sampradaya, advises us not to travel to different places of pilgrimage. Undoubtedly it is troublesome to go from one place to another, but one who is intelligent can take shelter of the lotus feet of Govinda and thereby be automatically sanctified as the result of his pilgrimage. Anyone who is fixed in the service of the lotus feet of Govinda is called tirtha-päda; he does not need to travel on various pilgrimages, for he can enjoy all the benefits of such travel simply by engaging in the service of the lotus feet of the Lord. The lotus feet of the Lord are known as mahat-padam; this means that the total source of material existence rests on the lotus feet of the Lord. As stated in Bhagavad-gita (10.8), ahaà sarvasya prabhavaù: everything is emanating from Him. This cosmic manifestation, which is compared to an ocean of nescience, is also resting on the lotus feet of the Lord. As such, this great ocean of nescience is minimized by a person who is a pure devotee. One who has taken shelter of the lotus feet of the Lord need not cross over the ocean, for he has already crossed it by virtue of his position at the Lord’s lotus feet. By hearing and chanting of the glories of the Lord or the Lord’s devotee, one can become firmly fixed in the service of the lotus feet of the Lord. Krishna’s lotus feet can liberate everyone but..
Lord Krishna is the fountainhead of the principle of vishnu-tattva, and therefore shelter of His lotus feet can deliver one from all sins, including an offense committed by a king unto a brahmana. Maharaja Parikshit, therefore, decided to meditate upon the lotus feet of Lord Sri Krishna, who is Mukunda, or the giver of liberations of all description. The banks of the Ganges or the Yamuna give one a chance to remember the Lord continuously. Maharaja Parikshit freed himself from all sorts of material association and meditated upon the lotus feet of Lord Krishna, and that is the way of liberation. To be free from all material association means to cease completely from committing any further sins. To meditate upon the lotus feet of the Lord means to become free from the effects of all previous sins. The conditions of the material world are so made that one has to commit sins willingly or unwillingly, and the best example is Maharaja Parikshit himself, who was a recognized sinless, pious king. But he also became a victim of an offense, even though he was ever unwilling to commit such a mistake. He was cursed also, but because he was a great devotee of the Lord, even such reverses of life became favorable. The principle is that one should not willingly commit any sin in his life and should constantly remember the lotus feet of the Lord without deviation. Only in such a mood will the Lord help the devotee make regular progress toward the path of liberation and thus attain the lotus feet of the Lord. There is such transcendental bliss in simply meditating on the lotus feet of the Lord that one can forget everything but the Lord’s transcendental form. The soles of the Lord’s lotus feet are marked with çaìkha-cakra-gadä-padma—conchshell, disc, club and lotus—and also by a flag and a thunderbolt. When Krishna walks on this earth or in the heavenly planets, these marks are visible wherever He goes. Vrindavan-dhama is a transcendental place because of Krishna’s walking on this land frequently. The inhabitants of Vrindavan were fortunate to see these marks here and there. When Akrüra went to Vrindavan to take Krishna and Balarama away to the festival arranged by Kansa, upon seeing the marks of the Lord’s lotus feet on the ground of Vrindavan , he fell down and began to groan. These marks are visible to devotees who receive the causeless mercy of the Supreme Personality of Godhead. The demigods were jubilant not only because the appearance of the Supreme Lord would do away with the burdensome demons, but also because they would be able to see upon the ground the transcendental marks from the soles of the Lord’s lotus feet. The gopis always thought of the Lord’s lotus feet when He was walking in the pasturing grounds, and, as described in the previous verse, simply by thinking of the Lord’s lotus feet, the gopis were fully absorbed in transcendence. Like the gopis, one who is always absorbed in thought of the Lord is beyond the material platform and will not remain in this material world. It is our duty, therefore, always to hear, chant and think about the Lord’s lotus feet, as actually done by Vaishvanas who have decided to live in Vrindavan always and think of the Lord’s lotus feet twenty-four hours a day. Even Krishna wants to taste His own toes! As the Supreme Personality of Godhead, You have taken birth from my abdomen. O my Lord, how is that possible for the supreme one, who has in His belly all the cosmic manifestation? The answer is that it is possible, for at the end of the millennium You lie down on a leaf of a banyan tree, and just like a small baby, You lick the toe of Your lotus foot. Since all the great sages and devotees apply all energy and all activities in the service of the lotus feet of the Lord, there must be some transcendental pleasure in the toes of His lotus feet. 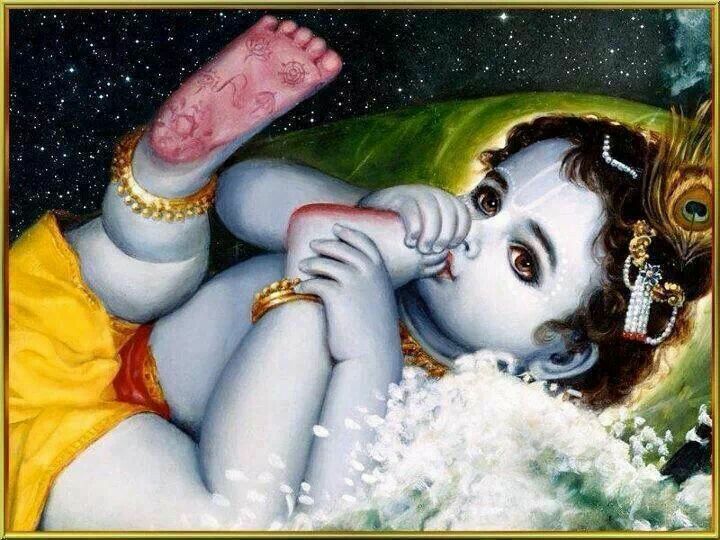 The Lord licks His toe to taste the nectar for which the devotees always aspire. Sometimes the Supreme Personality of Godhead Himself wonders how much transcendental pleasure is within Himself, and in order to taste His own potency, He sometimes takes the position of tasting Himself. Lord Caitanya is Kṛṣṇa Himself, but He appears as a devotee to taste the sweetness of the transcendental mellow in Himself which is tasted by Śrīmatī Rādhārāṇī, the greatest of all devotees.